The Easter bunny will hop into town on Saturday, March 26 from 12 to 2:30 pm, when he visits with youngsters at Kaleidoscope’s Sixth Annual Easter Garden Party, located in the center’s courtyard. The free family event will kick off with an Easter egg hunt at 12 noon. Youngsters should bring their own basket to collect Easter eggs. 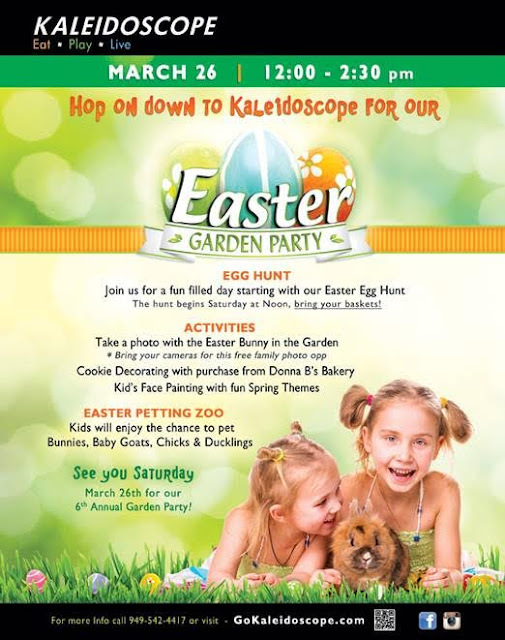 Passport cards will be given out to the first 250 children directing them to all Kaleidoscope businesses where they will each receive one candy-filled egg per business. The Easter Garden Party will also offer a complimentary photo opportunity with the Easter Bunny, for guests who bring their own camera. Adding to the fun will be cookie decorating from Donna B’s Bakery, free face painting, and a petting zoo with bunnies, baby goats, chicks, and ducklings. For more information on the event, please call Kaleidoscope management at (949) 542-4417. Follow the Kaleidoscope on social media for activities and happenings all year round - Instagram * Facebook * Twitter. Kaleidoscope Center is a 245,000 square foot lifestyle center located at 27741 Crown Valley Parkway, just off the 5 Freeway, in Mission Viejo.